Big Hit Entertainment revealed Thursday the full lineup of its new boy band Tomorrow X Together, or TXT. With Soobin as the leader, the quintet comprises Yeonjun, Hueningkai, Taehyun and Beomgyu. A two-minute introductory clip featuring the group attracted over 2.5 million YouTube views 10 hours after its release on Wednesday midnight. TXT’s official Twitter account, also launched simultaneously at midnight, had close to half a million followers as of Thursday morning. “TXT is about building a new tomorrow together by creating synergy working towards a shared dream,” said the agency of the newly formed act. Big Hit Entertainment was founded in 2005 by Bang Si-hyuk, who had previously worked with JYP Entertainment as a composer and producer. TXT will be the first group to debut under the agency since BTS’ debut in June 2013. On Oct. 18, 2018, BTS renewed its contract with Big Hit Entertainment, which has managed the group since day one, for the next seven years. 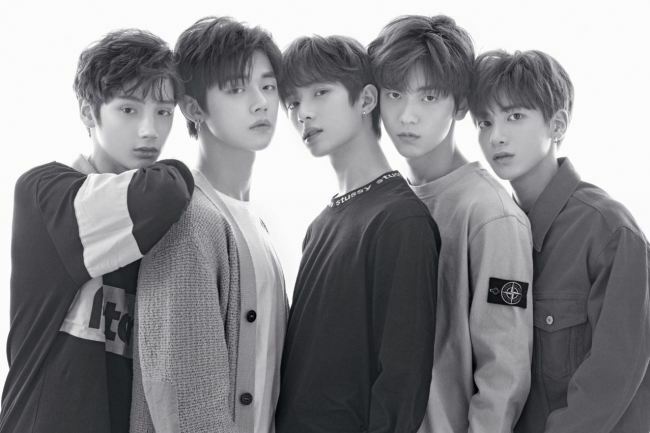 TXT is already creating buzz despite not having announced the release date of its first official album.